On Monday, July 09, 2018, at 1:50 a.m., a deputy, from Los Angeles County Sheriff’s Department Cerritos Station, was conducting commercial burglary suppression in the Cerritos Promenade, on the 11300 block of South Street. The deputy’s attention was drawn to the back parking lot of “Toys R Us”, where he saw two male adults and one female adult loading large copper parts into the rear of a vehicle. 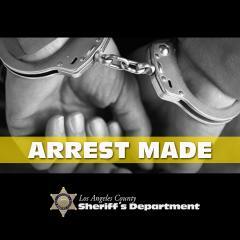 The deputy detained the three suspects pending a commercial burglary/grand theft investigation. Due to the size of the copper parts discovered, deputies believed they were from the roof of the location. Los Angeles County Fire Department (LAFD) personnel were contacted to assist the deputies in gaining access to the roof. Once deputies gained access to the roof they discovered large copper heating and air-conditioning units with large parts “cut-out”. The three suspects were transported and booked at Lakewood Sheriff’s Station for Grand Theft of Copper. 27 year-old Miguel Vega is being held in lieu of $70,529.00 bail. 28 year-old David GomezLeon is being held in lieu of $20,000.00 bail. 22 year-old Kimberly HernandezParral is being held in lieu of $20,000.00 bail.